Unlike padlocks, lock boxes are steel boxes that cannot be tampered with. It is almost impossible to break through these encased locks. These lock Boxes are big enough to fit most padlock sizes but custom sizes are also available . 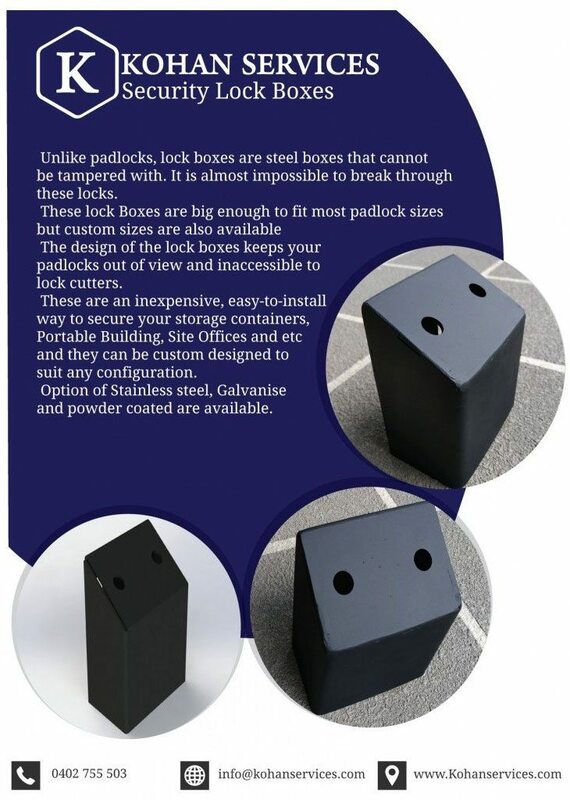 The design of the lock boxes keeps your padlocks out of view and inaccessible to lock cutters. These are an inexpensive, easy-to-install way to secure your storage containers, Portable Building, Site Offices and etc. they can be custom designed to suit any configuration. Option of Stainless steel, Galvanise and powder coated are available. One of the reasons why you need a Lock box is shown in this video below.